I've come close to doing a lot of different books. Usually my schedule complicates things, or someone changes their mind about me working on a book later in the game. Anyway, I thought you'd all get a kick out of seeing some of the behind the scenes stuff. Here's one that might actually happen someday, who knows. Anyway, Mike Oeming and I were going to do a big martial arts comic called Ballistic Fist. Our schedules just never seem to jibe, and we've never gotten it started. 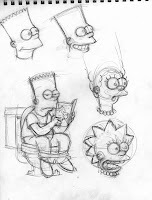 Oh, and I was in talks to do a Simpson comic. Again, my schedule just didn't work out. 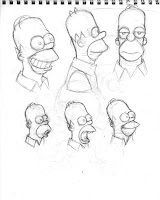 Anyway, here's some practice runs at the Simpsons. More in a day or two. That martial arts pic is badass.